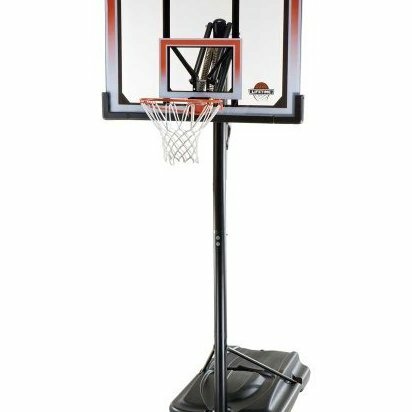 Portable basketball system with sturdy polyethylene base and bottom wheels. 50-inch shatter-proof polycarbonate backboard with fade-resistant graphics. 3-piece, 3.5-inch Round Action Grip pole adjusts from 7.5 feet to 10 feet Solid-steel Slam-It Rim with double-compression springs and welded net hooks. All-weather nylon net; base fills with water or sand; 5-year warranty.